CHANCELLOR'S NEW YEAR ADDRESS, YEAR 19 AQ. As is our custom Lady Stephanie and I like to begin the new calendrical year with a New Year’s Address to the Tradition sometime during the first or second week of each year. 2018, or Year 18 Aq., was a pretty momentous year for our Tradition. We expect that 2019 will be even more so. 2019 will be a year of many anniversaries. 2019 will be the Fortieth Anniversary of my acclamation as First Priest of the Correllian Tradition (Feb 6, 1979). This is also Lady Krystel’s Fortieth Anniversary as First Priestess, though she has retired in office. Lady Stephanie, Lady Krystel, and I will be celebrating the Anniversary at the Lustration of the Ancestors in Danville, IL, the weekend of May 3-5. We hope that many of you will join us there! In addition 2019 will be the Twenty-first Anniversary of The Daily Spell, founded by Rt Rev Ser Ed Correll, as well as the Twenty-First Anniversary of Monday Night Chancellor’s Chat. 2019 will be the Eighteenth Anniversary of Witch School (WitchSchool.com), founded by Rt Rev Ser Ed Correll, Lisa Tuit, and myself. It will be the Tenth Year for Pagans Tonight Radio Network (PagansTonight.com), founded by Rt Rev Ser Ed Correll. Pagans Tonight is currently retooling but will relaunch in February with a new name and 24 hour capacity. 2019 will be the Fourteenth Anniversary for Magick TV (MagickTV.com), which I founded, including thirteen years on Youtube. 2019 is also the Twentieth Anniversary of PURE Sanctuary Temple which will be hosting the Lustration of the Ancestors. 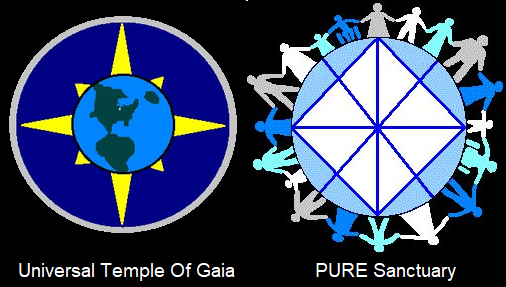 And it is the Twenty-eighth Anniversary of the Universal Temple of Gaia, formerly Holy City Temple, now resurgent in Chicago and serving as the Temple of the Order of Paladins. ​It’s rather sobering when you come to the point in your life when you are talking about the tenth anniversary of this, the twentieth anniversary of that, the fortieth anniversary of anything. It takes a lot to stick to something that long, through ups and downs, good times and bad times. One thing it shows: when we talk about things like Lifetime Memberships and long-term plans, we can be counted upon to be around. 2018 was a very busy year. 2018 was the Thirtieth Anniversary of the Crystal Web, as well as the Twentieth Anniversary of The Daily Spell. 2018 saw the publication of Lady Stephanie’s book ‘The Untraining of a Sea Priestess’. ​​2018 saw Rev Ed as a headline speaker at the Heartland Pagan Festival. This was a wonderful event which I also was privileged to attend, run by deeply committed, good people (see video below). ​all of which I will be appearing at again this year. These are great events and I highly recommend them all! For our own part, we hosted the Global Wicca Summit, whose purpose was to examine the position of Wicca as a contemporary global religion and what this means for us now and in the future. From the start we had hoped to present the findings of the Global Summit at the Parliament of the World’s Religions, but we were surprised and honored when the Global Summit was declared an official Pre-Parliament Event. As host of the Global Summit I would like to thank everyone who took part in the many presentations and discussions – your participation made the Global Summit truly a gathering of Wiccans from around the world. ​I would like to thank Rev Ser Lori Blackman for facilitating the Global Summit. I would also like to thank Rt Rev Ser Ed Correll for his role in organizing and publicizing the event. A huge thank you also to Rt Rev Belladonna LaVeau of the Aquarian Tabernacle, Rev Sir Alfred Willowhawk, Rev Debra Jeffries, and Rev Ted Ursus for their invaluable help across many platforms. Thank you to Pam Kelly for her help with audio programming! I would also like to thank Selena Fox, Janet Ferrar and Gavin Bone, Oberon Zell, Macha Nightmare, Rev Ser Apu Adman Aghama, and all of the many prominent leaders who took part! ​I am very grateful to M Rev Stephanie Leon Neal, Rt Rev Belladonna LaVeau, Rev Selena Fox, and Rev Dusty Dione for joining me on the panel. I would particularly like to thank Phyllis Curott for her invaluable help in working with the Parliament process. ​​2018 was also a watershed year for the Tradition in another, less pleasant, way. A larger number of Correllian Priesthood passed from this life in 2018 than in any previous year. Of course, this is a natural consequence of the expansion of the Tradition, but it is sobering none the less. Correllians who joined the Ancestors in 2018 included the great artist Abby Willowroot, former Records Officer Rev Virginia Powell, former Witch School Dean of Mentors Rev Karla Summers, and sitting First Elder Rt Rev Windy Lajoie. This was the first time that a member of the Correllian Council of Elders had died in 29 years, the first time that a First Elder had died in 31 years. For many Correllians this was the first time they had experienced a formal period of mourning. ​I want to thank Retired First Elder Rt Rev Ser Ed Correll for returning to the office of First Elder after Lady Windy’s crossing. This is the first time that a Retired Correllian First Elder has ever returned to office. ​​Arch Priestess Alyssa Maxon Kemp will be leading a special Memorial for Lady Windy at the Lustration of the Ancestors. I would like to thank Rt Rev Laurie Denman and Rev Phoenix Williams for filling Lady Windy’s role at Witch School. Major changes are underway at Witch School including the reorganization of the Mentor system and the rewrite of the site itself. Watch for more information about the changes in progress soon! ​Forty years is a long time, and much has changed during my forty years as Correllian First Priest. Our Tradition has grown from a small Familial Tradition into a global organization. For me, at least two thirds of this incarnation are now past. As I contemplate the remaining years of my life, my mind is strongly focused on the future and what shall come after me. Strengthening our infrastructure, increasing our activities, building strong forms that will stand the test of time, improving and safeguarding our position in the wider world -this is where I place my focus. As we go forward into the new year, let us go forward with the consciousness that we are not acting just for the moment but for the future as well. NEW YEAR ADDRESS, YEAR 18 AQ. The New Year is upon us, and as always Lady Stephanie and I would like to take this time to say a few words. We sincerely hope that the year now dawning will be a good year that will bring many blessings for all of us. I grant that, as 2017 ends, this seems a bit optimistic -but we are magic users and what good is magic if we cannot use it to make the world better for ourselves? We have much to look forward to this year. We have our Correllian Lustration which will be held at Our Lady of Light (http://www.CorrellianLustration.com) on April 27-29 in Winston-Salem, North Carolina. Special guests will be Arch Priestess Belladonna Laveau and Dusty Dione of the Aquarian Tabernacle Church (http://www.ATCWicca.org) and musician Morgan McPherson! We hope to see the completion of the Witch School rebuild, with improved services for our students. We have the new and improved Daily Spell which will be expanding and developing throughout the year. Rev. Don will be appearing at the Twenty-Fifth Annual St. Louis Pagan Picnic (http://www.PaganPicnic.org) June 3-4 in St. Louis, Missouri, at the Three Gates Gathering, (http://www.ThreeGatesGathering.com) June 8-10 in Missouri, and at WitchsFest USA (http://www.WitchsFestUSA.org) on July 13-15 in New York City. Perhaps most exciting we have the Parliament of the World's Religions (https://www.ParliamentOfReligions.org) in Toronto, Canada, from Nov. 1-7! It will certainly be a very active year! But what else awaits us this year? We have just entered 2018 AD, or by Correllian reckoning, 18 Aq. We are in the cusp of the turning of the Age, as we shall remain for many years. The character of the New Age is being built before our eyes. The world is wrestling with the possibilities that lie before it -old patterns continue to change and be broken, but what shall replace them? For we who work with spirit, this is not a passive issue. It is not simply a matter of waiting to see what we receive -we can and must influence the direction the world is taking, This is why we created the Peace Campaign and why our many Peace Warriors devote so much time and energy to advancing the cause of peace -that we might build a better and more just future. For we must never forget that peace is not merely the absence of conflict, but a world in which all may live without fear being hurt or killed simply because of who they are. This is the battle of our time; the great work we have spoken of for so long; birthing and then shaping the New Age. And as magic users we have a vital role to play, for many are trying to shape the future and not always in good ways. We must continue to bring our power to bear to help making a just, prosperous, and peaceful future. Having said all this, we have much to be thankful for as we enter Year 18 Aq. Chief among these for Lady Stephanie and myself is gratitude for you. We are grateful for your presence and support in our mutual mission. Our mission, the work that we are all doing together, is to more consciously integrate Spirit into matter through the teaching and practice of spirituality -through ritual, through meditation, through shadow work, through healing, through classes and workshops and seminars, through Temples and Shrines and Orders, through helping people to make a more conscious connection to Spirit in a thousand different ways and then using that connection to build a better life and through that better life a better world. Thank you for being part of this! Thank you for building a better world! We would also like to thank our Correllian Elders for all they do each day to help advance the Tradition's mission: Lady Windy Lajoie, Lady Anna Rowe, Ser Jason Highcorrell, Lady Raene Packery, Lord Eblis Pendragon, Lady Harwe Tuileva; thank you all so very much! Thank you also Lady Krystel High-Correll, Ser Ed Correll, Lady Virginia "Bitterwind" Smith for all you have done and still do to help us all! Thank you also to our Arch Priesthood: Ser Angela Munn, Lady Laurie Denman, Lady Lily Greene, Lady Alyssa Maxon Kemp! And thank you Ser Mike Neal for running our fundraising and the Corr Store (http://www.CorrStore.co)! These are the people who keep our Tradition running. They iterate and reiterate our teachings, they built and oversee the many platforms we use to advance our mission, manage the records of our global Tradition, raise money to keep us going, run the Temple Making Process, oversee our communications networks, manage our social media, and help our people to co-ordinate regionally around the world. Thank you all! We also want to thank our school staff, who keep Witch School (http://www.WitchSchool.com) functioning; Thank you Witch School President Lady Charlynn Walls! Thank you CTO Michael Ferrell! Thank you Membership Support Lady Laurie Denman! Thank you Dean of Students Lady Windy Lajoie! Thank you Lady Anna Rowe! Thank you Lady Vivian Dewey and Lady Shira Lanari! Thank you to the many Mentors and to everyone who helps to keep Witch School a vital and growing facility! Without you our tens of thousands of students around the world would not be able to have the rich experience that they do! We want to thank our social media people, notably the revamped Daily Spell (http://www.TheDailySpell.com) of which Rev. Don Lewis is Executive Publisher. Thank you Ser Ed Correll, Rev Lori Blackman, MaryAnn Kay, and everyone involved in The Daily Spell. This year marks the Twentieth Anniversary of the Daily Spell -a huge achievement! And to celebrate we have already begun to rebuild The Daily Spell bigger and better than ever, and will continue to increase its offerings throughout the year ahead! Thank you also to Pam Kelly for your excellent work as Station Manager at Pagans Tonight Radio Network (http://www.PagansTonight.com)! And finally, returning to the theme of the future and of Peace, we would like to thank all of our many Peace Warriors who have been devoting their time and energies to this vital activity. Thank you Ser Theresa Ott, Mother Peace Weaver! Thank you Ser Colin Keller and Ser Apu Adman Aghama! Thank you to all of our Peace Warriors! As we enter Year 18 Aquarius let us, as we have for many years, pray for peace. We pray for peace; we pray for love; we pray for stability; we pray for the nation where we live; we pray for the world! This has been an epochal year for the Correllian Tradition. In April of this year we seated a new First Priestess Coregent, Arch Priestess Stephanie Neal. This was the first investiture held in 37 years –that’s pretty memorable just by itself! Although we have had Regents from time to time, we have never had a Coregency before and I could not be happier with how it has turned out! First Priestess Stephanie and First Priestess Krystel now share this office, with Lady Stephanie taking the active duties of the office while Lady Krystel enjoys her (for the most part) retirement from public life. I want to thank Lady Stephanie for doing such a wonderful job in this role, and for being such a help and support to me. Go Lady Stephanie! This year was also the first full year of the Witch School site under Correllian Educational Ministries, which took over the Witch School site from Witch School International in Year 15. It has been an eventful year for Witch School and has seen many new personnel move up to take positions of in the administration. I want to thank Witch School President Rev. Charlynn Walls HP for all of her hard work this year! I would also like to thank Rev. Laurie Denman HP in Member Support, Rev. Windy Lajoie CCE, Rev. Anna Rowe CCE, and Rev Vivian Dewey HP for their work in the Mentoring Departments, Rev. Shira Lanari HP and Rev. Vega Lanari HP at the Ning Site, Rev. Lori Blackman in Social Media, and all of the many hardworking volunteers in our Mentoring and Media departments! I especially want to thank Michael Ferrell in Tech without whom we could not keep all of this going! Also a huge thank you to Pam Kelly at Pagans Tonight Radio and all of our wonderful PTRN hosts! Meanwhile, the http://www.correllian.com rewrite is finished and available for viewing now! This is the main website for the Correllian Nativist Church and it has been completely redone and extensively updated. Here you can learn about the Tradition’s structure and history, Correllian groups, Correllian authors, biographies of prominent Correllians, and more. Presently this remains a purely informational site- In the future a members-only section will be added, but that is still under construction. An important feature introduced this year and continued on the new http://www.correllian.com site is the Corr Store. The Corr Store is the Tradition’s store where you can find books, robes, patches, and more! You can find the CorrStore at http://www.CorrStore.co! There are lots of other great things coming for Year 17 as well. The Lustration of the Ancestors is shaping up to be a quite remarkable event. The Lustration of the Ancestors will be held on the weekend of March 31 – April 2. Phyllis Currott, former Vice Chair of the Parliament of the World’s Religions, will be our special guest. This year I will be Guest of Honor at the Aquarian Tabernacle’s Spring Mysteries Festival, April 13-16! I am really looking forward to that! You can learn more about the Spring Mysteries Festival at http://www.springmysteries.com! Also, as every year, I will be attending the St. Louis Pagan Picnic in St Louis (June 3-4, http://www.PaganPicnic.org) and WitchsFest USA in New York City (July 14-16, http://www.witchsfestusa.org) –these are wonderful events open to everyone so if you are in the area come on out and see us! And finally I will also be attending the first annual International Pagan Music Awards! You can learn more about IPMA at http://ipaganma.org! As for Year 16, it was a big year for me personally. This year I became a grandfather when my beautiful grandson Xander was born to my wonderful son John and daughter-in-law Michelle! How cool is that? I was so chuffed. Also this year marked my fortieth year as a Correllian Priest. That’s a long time. It has been a long road –though overall a wonderful adventure. It is not reasonable to think there will be forty more years, as that would leave me an improbably old man, but I do hope to have many more years in office. I have loved watching this Tradition expand, and loved watching its members grow and blossom. We have wonderful people in this Tradition, and I love you all. One year or twenty, I will be here for the duration (and then in all likelihood I will be back). So, as we go into the new calendrical year, I am pretty pleased and very excited for what is to come! I hope you are too because we are going to see some great things in our particular corner of the world! 11 November, Year 16 Aq. On this eleventh day of the eleventh month I find it necessary to make several statements on behalf of the Correllian First Priesthood and the Correllian Tradition. First, as a 501c3 organization it is necessary for the Tradition to remain aloof from partisan politics. As a religious organization, neither the Tradition nor its Priesthood can endorse or oppose specific political figures, candidates, or parties. This is part of the Separation of Church and State which we value highly. No Correllian Clergyperson is authorized to make any sort of partisan political statement, and any Clergyperson who does so is acting in contravention of both the Tradition's policy and the law of the land. This is based upon US law and custom, but is applicable as a Tradition policy anywhere that the Tradition has members. Having said that, it is perfectly acceptable, and indeed reasonably expected, for the Tradition and its Clergy to talk about moral values, issues, and teachings. Our moral values, issues, and teachings are separate from temporal and partisan politics, and are an aspect of the Correllian faith, rooted in our understanding of the Divine. Therefore on behalf of the First Priesthood, allow me to comment on the following moral values which our Tradition holds, which run throughout our teachings, and which are part and parcel of our view of Deity and the Soul. The Correllian Tradition believes emphatically in the equality of all races. All people, regardless of the race or ethnicity into which they were born, deserve to be treated with equal dignity and respect. All people, regardless of the race or ethnicity into which they were born deserve equal opportunities and equal protections under law and society. All people regardless of the race or ethnicity into which they were born should be judged on the merit of their character and their actions. Whenever we see people being mistreated because of their race or ethnicity, we have a spiritual duty to oppose that mistreatment and to stand up for what is right. The Correllian Tradition believes emphatically in gender equality. We believe that people of all genders deserve equal respect and equal treatment. All genders, female, male, and other, deserve to be treated decently and to have equal opportunities and equal protections under law and society. It is not right for one gender to be exalted above the others. It is not right that anyone should face discrimination, inequality, or violence simply because of their gender. Whenever we see people of any gender being discriminated against, receiving unequal treatment, or facing violence because of their gender, we have a spiritual duty to oppose such mistreatment and stand up for what is right. The Correllian Tradition believes emphatically in LGBTQ rights and marriage equality. We believe that sexual orientation is both a state of being and a right, which must be respected. We have practiced marriage equality long before it was the law of the land and will always practice marriage equality as an aspect of our spiritual beliefs and religious freedom. We regard so-called "conversion therapy" as an abomination never to be condoned under any circumstances. Whenever we see people facing violence or mistreatment because they are LGBTQ, we have a spiritual duty to oppose such mistreatment and stand up for what is right. Finally and perhaps obviously, the Correllian Tradition believes emphatically in the freedom and equality of all religions. This does not mean that we believe in or condone all religious practices, for some very heinous things have been or are done in the name or religion. Rather we believe that everyone has the inherent right to believe as they choose, so long as they are not harming others. We believe that all religions and philosophies should be viewed and treated with equal respect and dignity granted that they behave with equal respect and dignity. All religions share in common that they are made up of people, and there are good people and bad people in all religions including our own. Good people should always be honored and treated with equality and respect regardless of their religion or philosophy. Whenever we see good people of any religion or philosophy facing violence or persecution simply because of their spiritual beliefs, we have a spiritual duty to oppose such persecution and stand up for what is right. It is not right to expect equality for yourself if you are not treating others equally. It is not right to expect to live in peace yourself, if you do not live in peace with others. A belief spoken but not lived is no belief at all. Here is the Oracle of the Ancestors from the Lustration of the Living in Jacksonville. And we rejoice in you"
As you know, it has been my custom these many years to begin each new Calendrical Year with a New Year’s Address. Candlemas of this year will mark the thirty-seventh year since Lady Krystel and I became First Priestess and Priest of the Correllian Tradition. That is a long time, and after so long it is no wonder that Lady Krystel has chosen to retire-in-office these last few years. As for myself, I have given my life to the Correllian Tradition and I rejoice in watching the younger generations of Correllian Priesthood coming into their own. Nonetheless, I do not perceive retirement as being anywhere in my future. Last year, Year 15 Aq. / 2015 AD, was a major year for the Correllian Tradition. We had many great happenings, some of which bode extremely well for the future. Perhaps the most remarkable of these events was the creation of Correllian Educational Ministries. Correllian Educational Ministries is an integrated seminary of the Correllian Nativist Church, with its principle duty being to train Correllian Clergy and educate the wider public about Correllian and broader Pagan religion. The Witch School platforms including Magick TV and Pagans Tonight Radio, are now under Correllian Educational Ministries and thus directly under the Tradition itself. We hope through this to renew and revitalize our educational systems. Many new classes and programs are planned, which we hope to put in place in the new year. We have high hopes for Correllian Educational Ministries and hope that you will enjoy the many new offerings planned. You can learn more about Witch School and Correllian Educational Ministries at www.WitchSchool.com! Also in Year 15 Aq. / 2015 AD the Correllian Tradition sent a large delegation to the Parliament of the World’s Religions in Salt Lake City, Utah. This was a wonderful adventure in which our Correllian delegates got to meet and interact with delegates from a wide range of other religions. Rarely have we enjoyed an event more! You can read all about this great adventure at http://www.correllian.com/PWR2015.html and see lots of videos at www.YouTube.comMagickTV! Some of the best moments at the Parliament were seeing our Clergy people presenting in various workshops. Rev. Laurie Denman led a presentation on the International Peace Warriors. Rev. Eblis and Rev. Ser Jeanine DeOya offered a presentation on Diversity in Modern Paganism. And Rev. Karen Silva presented on Sacred Dance. How wonderful is that? In addition, our own Arch Priestess Stephanie walked in the Parliaments Opening Procession. I could not have been prouder of these and all of our Correllian delegates, every one of whom did a fantastic job of representing our Tradition! Thank you all! Also in Salt Lake City Rev. Angela Munn hosted a Regional Lustration of the Living on the night the Parliament ended. We were honored to have many religious leaders present including Selena Fox of Circle, Rt. Rev. Linda Isles of the Fellowship of Isis Triad Union, and Yvonne Conway-Williams of the Covenant of the Goddess, and many other great people! It was a truly splendid evening – Thank you Rev Angela for your work in facilitating this! Among the momentous announcements at the Regional Lustration were a number of important appointments. Rev. Lori Barberio Keigans was been appointed as the Press Secretary for the Correllian Tradition, and Head of the Correllian Press Corps. Congratulations Rev. Lori! Rt. Rev. Harwe Tuileva was appointed to the Correllian Council of Elders –congratulations Arch Priestess Harwe! Rt. Rev. Harwe has done much wonderful work over many years and we look forward to working with her on the Council of Elders for many years to come! This will be the first time that the investiture ceremony has been performed in thirty-seven years, and it is not expected that it will be performed again for many years to come, so if you are able to attend please do! Finally, we had appointed a new First Elder at the Regional Lustration, as Lady Stephanie’s acclamation as Coregent left this office open. However this appointment has not worked out and the office is again vacant. Therefore it gives Lady Stephanie and I great pleasure to announce that the new First Elder of the Correllian Tradition is the Arch Priestess Windy Lajoie. Congratulations Lady Windy and may the blessing be upon you! We rejoice to have you with us as we continue forward into Year 16 Aquarius – we feel it will be the best year yet! Many new adventures are to come! The world is melting down on all sides, but we are called by Goddess to be strong and help to focus the energies of the New Age in positive ways that will help the world rebuild. Each of us has a role –let us go forward together!